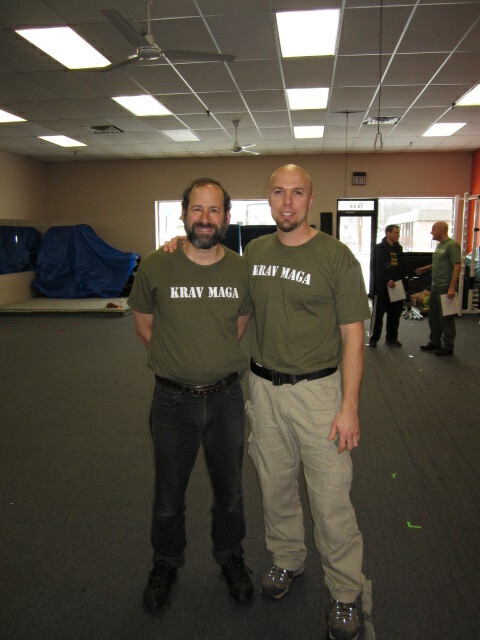 Moshe Katz and Colby Taylor, Krav Maga instructors. We use a phrase within our Covenant Defense community that has become common. "I'm always armed, sometimes I carry a weapon." Here's the backstory on where this phrase comes from and how it carries some lessons for our current cultural challenges. I had just entered a local radio studio and introduced myself to the radio host. Partly as an attempt to create banter and partly for security reasons he asked me if I was currently "armed". Without thinking about it my reply was, "I am always armed, sometimes I carry a weapon." My response was not planned or orchestrated, I was simply making a point that having a gun is not the end all solution to solving security challenges. He picked up on the statement and its depth and it became the topic of our on air interview. So what does this statement mean? "I am always armed..."
It means that first and foremost my mindset is one that is always making an effort to be aware of the potential dangers and processing ahead of time how I would react. In a sense I am thinking of the "if, then" scenarios that could develop. For example, if someone comes through that entrance presenting a gun and yelling LaLa Snackbar I will respond by charging him and attempting to take away the gun. It means that I attempt to live in a state or readiness to be able to respond immediately and appropriately to acts of violence. Being armed essentially is just like being set to "explode" into action if the situation dictates that to be appropriate. It means I am continually training my body physically to be able to move to the best of my ability and be as strong and injury resistant as I can be. This is a lifestyle that covers many things including nutrition, mindset, strength training, flexibility, rest, injury management, metabolic conditioning, and skill training. It means embracing the fact that defensive skillsets are perishable and need to be rehearsed. Additionally it means I respect that violence is highly unpredictable and irregardless of one's level of training you are never invulnerable or bulletproof. Being willing to be a Protector of the Covenant means you fully understand the risks associated with engagement. I am constantly learning and re-evaluating the way we approach things to see if there is a better way to overcome a challenge to ensure the safety of those we are protecting. As you can imagine being a Protector as I have described above is much more costly in terms of time, money, and human resources than simply carrying a gun. We are very passionate about training to use a firearm appropriately in a defensive situation as well, but believe that a good foundation in mindset and skillsets that don't require a firearm are imperative. You will always have your mind and your body with you so that is where we need to build the foundation of your defensive toolbox. Many ideas are currently being discussed regarding arming teachers, providing security guards, and making schools open to CPL carriers. These ideas are supposed to improve the security of schools. I can also tell you the #1 most common security plan for most churches is get some guys to start bringing their guns to church and resolve that is all that is needed. Inserting individuals with guns is way less costly in terms of time, training, and money than training people in a comprehensive manner how to handle violent situations. It is less costly on the front end to simply add guns to the scenario, however I believe it has the potential to be far more costly in terms of the possible tragic outcomes. The first time that church security team members kill a bunch of folks in their own church while attempting to shoot the bad guy we will see huge change in how we view this situation. I hope and pray that we can get this figured out long before something like that happens. Being a Protector of the Covenant is about a lot more than simply carrying a gun. It's about having our identity fully established by God's declaration that we are His Beloved and He is fully pleased with us. This fills in all our gaps that could become occupied by some type of compensatory behavior leading to ego and arrogance. It's about understanding and embracing the role of being ambassadors of God on earth. Its about realizing we have huge part to play in shaping our culture as we are the image bearers of His Kingdom on earth. It's about embracing a lifestyle very different than the cultural norm as we devote ourselves to being in alignment with the design for mankind put into motion by our Creator. It's about embracing what the best solutions to our current security challenges truly are. We shouldn't let our favorite hobby become the "best solution" when it really is not. It's about working as a team and pre-planning how we will handle violent conflict. It's about learning to move well and being willing to stick with it when it does not come naturally to us right away. It's about accepting that as much as we may want to check the box and say the problem is fixed, it never is completely "fixed" and requires our ongoing dedication. "Always be armed, and sometimes also carry a gun."